Russian President Vladimir Putin and his South African counterpart Jacob Zuma have offered their condolences to the President of Nepal Ram Baran Yadav for the loss of Nepalese lives in Saturday’s devastating earthquake. Moscow is also dispatching a team of more than fifty rescue workers to Nepal to assist in the relief and rescue operations. “More than fifty rescue workers from the Tsentrospas detachment and the Leader center are prepared for go to Nepal immediately. They have expansive experience of operations in the areas struck by earthquakes. These rescuers have helped eliminate the aftermaths of quakes in Haiti, Turkey and China,” an official at Russia’s Ministry for Emergency Situations said in Moscow. The Russian team is armed with high-tech equipment that would enable it to work autonomously in the quake-hit Himalayan country. “Putin expressed his condolences to President of Nepal Ram Baran Yadav on the human casualties and serious damage caused by the earthquake in various parts of Nepal,” said a Kremlin statement on Saturday. South African President Jacob Zuma has also sent his condolences to the Nepalese government in the wake of the massive tragedy that has killed more than 900 people. “Heartfelt condolences from President Zuma to government & people of Nepal following the earthquake,” tweeted Clayson Monyela, spokesperson at the South African Foreign Ministry. 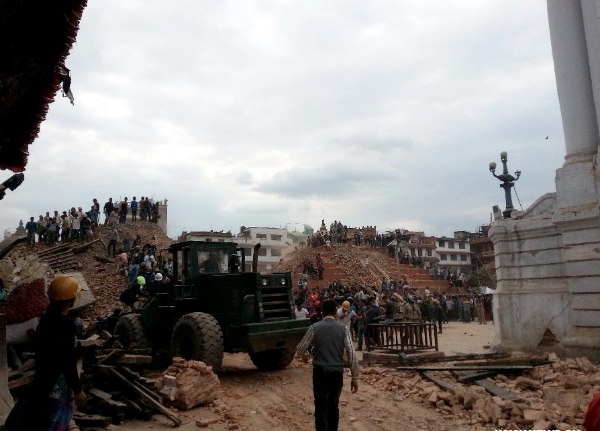 Geoff Doidge, South African envoy to Nepal said all five South Africans in Nepal are unhurt. India has said it is sending ten teams of disaster response personnel to Nepal alongwith relief aid, including medical supplies. Two Indian aircrafts laden with 5 tonnes of relief material has already left for the neighbouring country. The death toll in Nepal is still rising and hundreds are reported missing.